Participants 140 adults, mean age 49.5 years (range 35.7-59.9), with degenerative medial meniscal tear verified by magnetic resonance imaging. 96% had no definitive radiographic evidence of osteoarthritis. Conclusion The observed difference in treatment effect was minute after two years of follow-up, and the trial’s inferential uncertainty was sufficiently small to exclude clinically relevant differences. Exercise therapy showed positive effects over surgery in improving thigh muscle strength, at least in the short term. Our results should encourage clinicians and middle aged patients with degenerative meniscal tear and no definitive radiographic evidence of osteoarthritis to consider supervised exercise therapy as a treatment option. Only one small pilot study (n=17) compared the effect of surgery alone with exercise alone.14 Of the five other published randomised controlled trials,8 9 10 11 12 13 four8 9 10 11 13 were designed to study the effect of surgery in addition to exercise therapy, and the remaining study12 compared meniscectomy to sham surgery. Considering the large amount of surgery performed worldwide, and the inconsequential short term additional pain relief seen from surgery in addition to exercise, randomised controlled trials are needed to explore the comparative treatment effect of partial meniscectomy alone with supervised exercise therapy alone. Furthermore, only two of the five published randomised controlled trials included patients with no definitive radiographic evidence of osteoarthritis.12 13 The aim of this study was to determine if exercise therapy is superior to arthroscopic surgery for knee function in middle aged patients with degenerative meniscal tears verified by magnetic resonance imaging. Between October 2009 and September 2012, we recruited participants from the orthopaedic departments at Oslo University Hospital (October 2009-April 2011) and Martina Hansens Hospital (May 2011-September 2012) in Norway. All patients provided informed written consent before participation. Inclusion criteria were age 35-60 years; unilateral knee pain for more than two months without a major trauma (defined as sudden onset of knee pain resulting from a single physical impact event); medial degenerative meniscal tear verified by magnetic resonance imaging; and, at most, radiographic changes equivalent to grade 2 according to the Kellgren-Lawrence classification.17 Standing posterior-anterior radiographs were taken in a fixed flexion position, using a Synaflexer (Synarc, Newark, CA) frame.18 We defined a degenerative meniscal tear as an intrameniscal linear magnetic resonance imaging signal penetrating one or both surfaces of the meniscus.19 Furthermore, the patients had to be eligible for arthroscopy, be able to participate in exercise therapy, and understand Norwegian. One of two orthopaedic surgeons confirmed eligibility for surgery based on the patient’s history, physical examination, and findings on magnetic resonance imaging. Exclusion criteria were acute trauma, locked knee, ligament injury, and knee surgery in the index knee during the previous two years. The exercise therapy intervention was carried out at one of two clinics (Norwegian Sports Medicine Clinic and Gnist Trening og Helse AS), using the same protocol and started as soon as possible after randomisation—or later if preferred by the participant. The exercise therapy programme, outlined in supplementary figure S1 and previously described in detail,20 consisted of progressive neuromuscular and strength exercises over 12 weeks, performed during a minimum of two and a maximum of three sessions each week (24-36 sessions). The participants filled in exercise diaries, and we assessed compliance with exercise as the total number of exercise sessions completed out of 24 sessions. Excellent compliance was predefined as participation in 24 or more sessions (100%), satisfactory compliance as 19-23 sessions (80-100%), and poor compliance as 18 or fewer sessions (<80%). In the per protocol analysis, we defined completing 18 or fewer sessions as not following the protocol. 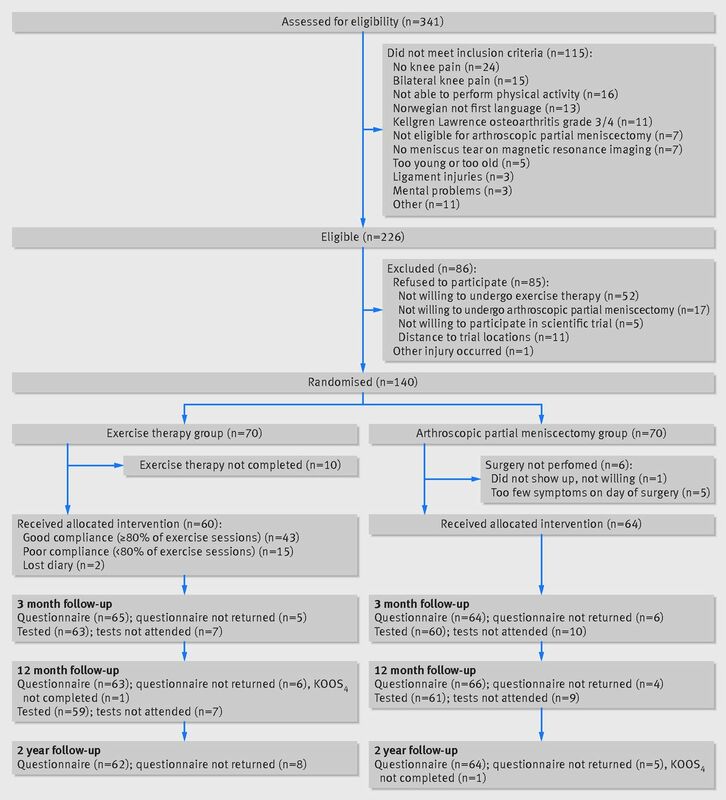 Likewise, if participants in the meniscectomy group received physiotherapist instructed exercise therapy postoperatively of adequate quality for at least 18 sessions, they were defined as not following the protocol. Arthroscopic surgery was performed as soon as possible after randomisation, depending on waiting lists and participant preference. The arthroscopic intervention was similar in both hospitals, performed as standard operations for arthroscopic partial meniscectomy, and the participants followed normal preoperative, perioperative, and postoperative routines. Six orthopaedic surgeons with at least 10 years of clinical experience performed the operations. One surgeon performed 39 (61%) operations, and the other five surgeons performed 1-15 operations each. The participants were discharged from hospital on the day of surgery and were advised to use two crutches postoperatively until gait normalised and no swelling or discomfort occurred during weight bearing. Before hospital discharge the participants were given written and oral instructions for simple home exercises, aimed at regaining knee range of motion and reducing swelling. They were encouraged to perform the exercises two to four times daily (see supplementary figure S2a-d for written instructions). We used three reliable and valid performance tests26 27 28 to evaluate lower extremity function: the one leg hop test for distance (measuring length in centimetres), the 6 m timed hop test (measuring time in seconds), and the knee bends test (measuring maximum number in 30 seconds). These test procedures have been described previously.29 The test protocol included a 10 minute warm-up on a stationary bicycle, followed by the muscle strength and lower extremity performance tests. The first leg to be tested was determined by randomisation, and the same order was applied at the follow-up assessments. Tests of thigh muscle strength and lower extremity performance were conducted at baseline and at three and 12 month follow-ups. Out of 341 patients assessed for eligibility, 226 were eligible and 140 (41%) were randomised to the two treatment groups, each with 70 participants. Questionnaires were completed by 129 participants (92%) at three and 12 months and 126 (90%) at two years (fig 1⇓). In the exercise group, 43 out of 70 (61%) participants completed the exercise therapy programme with satisfactory (17 participants) or excellent (26 participants) compliance. These participants on average completed 25 exercise sessions (median 25, range 19-36). Fifteen participants had poor compliance, 10 declined exercise therapy, and two had lost their exercise diaries. In the arthroscopic partial meniscectomy group, six participants out of 70 (9%) did not undergo surgery, owing to personal preference (one participant) or too few knee symptoms on the day of surgery (five participants) (fig 1⇑). 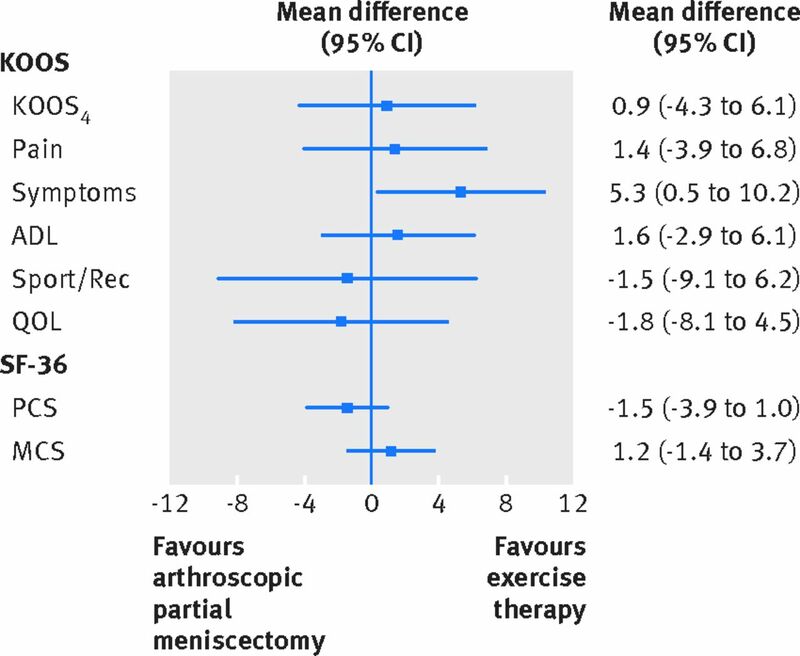 Five participants in the meniscectomy group received passive postoperative physiotherapy (median 2 sessions, range 1-3), but none crossed over to exercise therapy. Table 1⇓ presents the baseline characteristics of the participants. The study specific and subscale specific cut-off for a clinically relevant difference between groups in KOOS4 was 10.1. In the intention to treat analysis, there was no clinically relevant difference in change between groups from baseline to two year follow-up in KOOS4 score (0.9 points, 95% confidence interval −4.3 to 6.1; P=0.72) after adjustment for baseline imbalance and randomisation stratification factors. The mean improvements were 25.3 points (21.6 to 29.0) in the exercise group and 24.4 points (20.7 to 28.0) in the meniscectomy group (fig 2⇓). Likewise, there were no clinically relevant differences between groups in KOOS4 score from baseline to follow-ups at 3 and 12 months (fig 2⇓). Sixty two participants in the exercise group and 64 in the meniscectomy group were included in the intention to treat analysis (fig 1⇑). Both the per protocol and the as treated analysis included 34 participants in the exercise group, and 58 and 70 participants in the meniscectomy group, respectively (see supplementary figure S3). The exercise group had significantly greater improvement in all muscle strength variables at three months (P≤0.004) (fig 3⇓). Results were similar for the per protocol and as treated analyses (see supplementary table S2). Figures 3-5⇓ show the results of the secondary outcomes at three months, 12 months, and two years (also see supplementary tables S1 and S2). From baseline to two year follow-up, the exercise group had a 5.3 point statistically significant but clinically insignificant greater improvement in scores on the KOOS subscale for symptoms than the meniscectomy group (95% confidence interval 0.5 to 10.2; P=0.03). The study specific and subscale specific cut-offs for interpretation of clinically relevant differences were: 7.4 for pain, 8.4 for symptoms, 4.1 for activities of daily living, 10.9 for function in sport and recreation, and 13.6 for knee related quality of life. Clinically comparable improvements were found for all five KOOS subscales at all time points, with the exception of 12 months, where the meniscectomy group reported significantly or clinically relevant better scores for knee related quality of life and function in sport and recreation (see supplementary figure S4). There were no clinically relevant differences between the groups in SF-36. Results for per protocol and as treated analyses were similar to the intention to treat analyses (see supplementary tables S1 and S2). The exercise group also had significantly greater improvement in all muscle strength tests at the 12 month follow-up (P<0.03). The exercise group had significantly greater improvement in the 6 m timed hop test at three months (P=0.02) and 12 months (P=0.04), but not in the one leg hop test or the knee bend test (fig 4⇑). Results for per protocol and as treated analyses of the knee bend test were in favour of the exercise group at three months (see supplementary table S2). 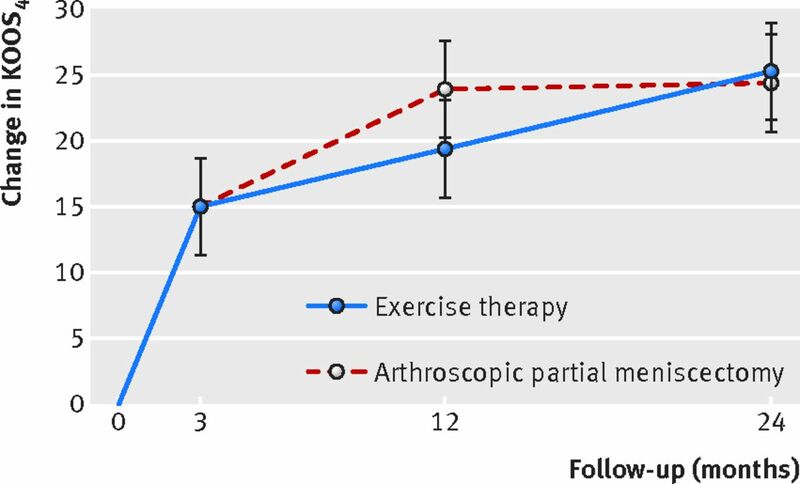 Supervised exercise therapy showed positive effects over arthroscopic partial meniscectomy in improving thigh muscle strength, at least in the short term, but not in patient reported outcomes, where the groups reported clinically comparable improvements at two years. Our findings confirm previous studies evaluating the patient reported effect of surgery in addition to exercise compared with exercise alone.9 10 11 13 In our study, only 4% of participants had definitive radiographic evidence of osteoarthritis. Thus, our study extends previous findings to patients with early or no radiographic evidence of osteoarthritis. Patient reported outcomes are prone to placebo effects.31 Although placebo effects are greater after invasive interventions such as surgery,31 32 they are also present from non-invasive passive treatments such as inactive ultrasonography and inert gel.33 In exercise studies, where the patient, not the therapist, performs the intervention, placebo effects are less obvious, although attention effects cannot be excluded. Objective outcomes are less prone to placebo effects,31 and a valuable addition for interpretation of clinical trials comparing surgical interventions with non-surgical interventions. Although we found no significant differences between treatments when evaluated using patient reported outcomes, muscle strength was significantly more improved in the supervised exercise group, directly after the intervention at both three months and 12 months. We cannot exclude the possibility that the greater placebo effect from surgery on patient reported outcomes masks a “real” difference in treatment between groups. It is a limitation of the study that we did not include a sham surgery group, which would have been needed to disentangle these mechanisms. The strengths of this study are the randomised controlled trial design, the multiple assessments, the high rate of participation in the two year follow-up, the use of valid and reliable patient reported outcomes, as well as inclusion of tests for muscle strength and performance21 22 and the blinding of the assessors. In addition to the lack of a sham surgery group, a limitation of comparing surgical with non-surgical treatment is the possibility of crossover from the non-surgical group to the surgical group. Crossover in our study was based on a clinical evaluation by the orthopaedic surgeon, initiated by either the participant or the physiotherapist. We failed to apply a stricter approach to determining crossover, such as requiring the evaluation of the patient’s symptoms and knee related quality of life with a questionnaire that had a preset cut-off score. The observed difference in treatment effect was minute after two years’ follow-up, and the trial’s inferential uncertainty, as shown by the 95% confidence limits, was sufficiently small to exclude clinically relevant differences. Supervised exercise therapy showed positive effects over surgery in improving thigh muscle strength, at least in the short term. Nineteen per cent of participants allocated to exercise therapy crossed over to surgery during the two year follow-up, with no additional benefit. No serious adverse events occurred in either group during the two year follow-up. Our results should encourage clinicians and middle aged patients with degenerative meniscal tear and no radiographic evidence of osteoarthritis to consider supervised structured exercise therapy as a treatment option. We thank the patients for their participation; research coordinators Kristin Bølstad and Emilie Jul-Larsen for the organisation of the participants; physiotherapists Marte Lund, Karin Rydevik, and Christian Vilming for assistance with data collection; the Norwegian Sports Medicine Clinic (NIMI), Oslo, Norway, for supporting the Norwegian Research Center for Active Rehabilitation (NAR) with rehabilitation facilities and research staff (NAR is a collaboration between the Norwegian School of Sports Sciences, Department of Orthopaedic Surgery, Oslo University Hospital, and NIMI); and the Department of Orthopaedic Surgery, Oslo University Hospital and the Department of Orthopaedic Surgery, Martina Hansens Hospital, Bærum, for accessibility to the outpatient and surgical clinics. Contributors: EMR, MAR, and SS conceived and designed the study. SS, LE, and NJK collected the data. SS trained most participants. LE and NJK operated on most participants. NJK and EMR drafted the article. Jonas Ranstam performed the statistical analyses. All authors participated in the analysis and interpretation of the data, revision of the article, and final approval of the version to be published. EMR is the guarantor. All authors had full access to all of the data including statistical reports and tables in the study and take responsibility for the integrity of the data and the accuracy of the data analysis. Funding: This study was funded by Sophies Minde Ortopedi AS, Swedish Rheumatism Association, Swedish Scientific Council, Region of Southern Denmark, Danish Rheumatism Association, and the Health Region of South-East Norway. The researchers were independent from the funder. Competing interests: All authors have completed the ICMJE uniform disclosure form at www.icmje.org/coi_disclosure.pdf (available on request from the corresponding author) and declare: no support from any company for the submitted work; no relationships with any company that might have an interest in the submitted work in the previous three years; their spouses, partners, or children have no financial relationships that may be relevant to the submitted work; and they have no non-financial interests that may be relevant to the submitted work. Ethical approval: This study was approved by the regional ethics committee of the Health Region of South-East Norway (reference No 2009/230). Data sharing: Anonymised data will be shared on reasonable request. Transparency: The lead author (NJK) affirms that the manuscript is an honest, accurate, and transparent account of the study being reported; that no important aspects of the study have been omitted; and that any discrepancies from the study as planned have been explained. Data sharing: we agree to share anonymised data upon reasonable request. Abrams GD, Frank RM, Gupta AK, Harris JD, McCormick FM, Cole BJ. Trends in meniscus repair and meniscectomy in the United States, 2005-2011. Am J Sports Med2013;41:2333-9. doi:10.1177/0363546513495641 pmid:23863849. Lohmander LS, Englund PM, Dahl LL, Roos EM. The long-term consequence of anterior cruciate ligament and meniscus injuries: osteoarthritis. Am J Sports Med2007;35:1756-69. doi:10.1177/0363546507307396 pmid:17761605. Reigstad O, Grimsgaard C. Complications in knee arthroscopy. Knee Surg Sports Traumatol Arthrosc2006;14:473-7. doi:10.1007/s00167-005-0694-x pmid:16208459. Thorlund JB, Hare KB, Lohmander LS. Large increase in arthroscopic meniscus surgery in the middle-aged and older population in Denmark from 2000 to 2011. Acta Orthop2014;85:287-92. doi:10.3109/17453674.2014.919558 pmid:24800623. Englund M. The role of the meniscus in osteoarthritis genesis. Med Clin North Am2009;93:37-43, x. doi:10.1016/j.mcna.2008.08.005 pmid:19059020. Englund M, Roos EM, Roos HP, Lohmander LS. Patient-relevant outcomes fourteen years after meniscectomy: influence of type of meniscal tear and size of resection. Rheumatology (Oxford)2001;40:631-9. doi:10.1093/rheumatology/40.6.631 pmid:11426019. Thorlund JB, Juhl CB, Roos EM, Lohmander LS. Arthroscopic surgery for degenerative knee: systematic review and meta-analysis of benefits and harms. Br J Sports Med2015;49:1229-35. doi:10.1136/bjsports-2015-h2747rep pmid:26383759. Gauffin H, Tagesson S, Meunier A, Magnusson H, Kvist J. Knee arthroscopic surgery is beneficial to middle-aged patients with meniscal symptoms: a prospective, randomised, single-blinded study. Osteoarthritis Cartilage2014;22:1808-16. doi:10.1016/j.joca.2014.07.017 pmid:25086401. Herrlin S, Hållander M, Wange P, Weidenhielm L, Werner S. Arthroscopic or conservative treatment of degenerative medial meniscal tears: a prospective randomised trial. Knee Surg Sports Traumatol Arthrosc2007;15:393-401. doi:10.1007/s00167-006-0243-2 pmid:17216272. Herrlin SV, Wange PO, Lapidus G, Hållander M, Werner S, Weidenhielm L. Is arthroscopic surgery beneficial in treating non-traumatic, degenerative medial meniscal tears? A five year follow-up. Knee Surg Sports Traumatol Arthrosc2013;21:358-64. doi:10.1007/s00167-012-1960-3 pmid:22437659. Katz JN, Brophy RH, Chaisson CE, et al. Surgery versus physical therapy for a meniscal tear and osteoarthritis. N Engl J Med2013;368:1675-84. doi:10.1056/NEJMoa1301408 pmid:23506518. Sihvonen R, Paavola M, Malmivaara A, et al. Finnish Degenerative Meniscal Lesion Study (FIDELITY) Group. Arthroscopic partial meniscectomy versus sham surgery for a degenerative meniscal tear. N Engl J Med2013;369:2515-24. doi:10.1056/NEJMoa1305189 pmid:24369076. Yim JH, Seon JK, Song EK, et al. A comparative study of meniscectomy and nonoperative treatment for degenerative horizontal tears of the medial meniscus. Am J Sports Med2013;41:1565-70. doi:10.1177/0363546513488518 pmid:23703915. Østerås H, Østerås B, Torstensen TA. Medical exercise therapy, and not arthroscopic surgery, resulted in decreased depression and anxiety in patients with degenerative meniscus injury. J Bodyw Mov Ther2012;16:456-63. doi:10.1016/j.jbmt.2012.04.003 pmid:23036877. Stensrud S, Risberg MA, Roos EM. Effect of exercise therapy compared with arthroscopic surgery on knee muscle strength and functional performance in middle-aged patients with degenerative meniscus tears: a 3-mo follow-up of a randomized controlled trial. Am J Phys Med Rehabil2015;94:460-73. doi:10.1097/PHM.0000000000000209 pmid:25299520. Hall M, Juhl CB, Lund H, Thorlund JB. Knee Extensor Muscle Strength in Middle-Aged and Older Individuals Undergoing Arthroscopic Partial Meniscectomy: A Systematic Review and Meta-Analysis. Arthritis Care Res (Hoboken)2015;67:1289-96. doi:10.1002/acr.22581 pmid:25776139. Kellgren JH, Lawrence JS. Radiological assessment of osteo-arthrosis. Ann Rheum Dis1957;16:494-502. doi:10.1136/ard.16.4.494 pmid:13498604. Kothari M, Guermazi A, von Ingersleben G, et al. Fixed-flexion radiography of the knee provides reproducible joint space width measurements in osteoarthritis. Eur Radiol2004;14:1568-73. doi:10.1007/s00330-004-2312-6 pmid:15150666. Crues JV 3rd, , Mink J, Levy TL, Lotysch M, Stoller DW. Meniscal tears of the knee: accuracy of MR imaging. Radiology1987;164:445-8. doi:10.1148/radiology.164.2.3602385 pmid:3602385. Stensrud S, Roos EM, Risberg MA. A 12-week exercise therapy program in middle-aged patients with degenerative meniscus tears: a case series with 1-year follow-up. J Orthop Sports Phys Ther2012;42:919-31. doi:10.2519/jospt.2012.4165 pmid:22960783. Roos EM, Lohmander LS. The Knee injury and Osteoarthritis Outcome Score (KOOS): from joint injury to osteoarthritis. Health Qual Life Outcomes2003;1:64. doi:10.1186/1477-7525-1-64 pmid:14613558. Roos EM, Roos HP, Ekdahl C, Lohmander LS. Knee injury and Osteoarthritis Outcome Score (KOOS)--validation of a Swedish version. Scand J Med Sci Sports1998;8:439-48. doi:10.1111/j.1600-0838.1998.tb00465.x pmid:9863983. Kamper SJ, Maher CG, Mackay G. Global rating of change scales: a review of strengths and weaknesses and considerations for design. J Man Manip Ther2009;17:163-70. doi:10.1179/jmt.2009.17.3.163 pmid:20046623. Drouin JM, Valovich-mcLeod TC, Shultz SJ, Gansneder BM, Perrin DH. Reliability and validity of the Biodex system 3 pro isokinetic dynamometer velocity, torque and position measurements. Eur J Appl Physiol2004;91:22-9. doi:10.1007/s00421-003-0933-0 pmid:14508689. Ware JE Jr, , Sherbourne CD. The MOS 36-item short-form health survey (SF-36). I. Conceptual framework and item selection. Med Care1992;30:473-83. doi:10.1097/00005650-199206000-00002 pmid:1593914. Ross MD, Langford B, Whelan PJ. Test-retest reliability of 4 single-leg horizontal hop tests. J Strength Cond Res2002;16:617-22.pmid:12423195. Bolgla LA, Keskula DR. Reliability of lower extremity functional performance tests. J Orthop Sports Phys Ther1997;26:138-42. doi:10.2519/jospt.1997.26.3.138 pmid:9276854. Bremander AB, Dahl LL, Roos EM. Validity and reliability of functional performance tests in meniscectomized patients with or without knee osteoarthritis. Scand J Med Sci Sports2007;17:120-7.pmid:17394472. Stensrud S, Risberg MA, Roos EM. Knee function and knee muscle strength in middle-aged patients with degenerative meniscal tears eligible for arthroscopic partial meniscectomy. Br J Sports Med2014;48:784-8. doi:10.1136/bjsports-2012-091540 pmid:23242961. Satterthwaite FE. An approximate distribution of estimates of variance components. Biometrics1946;2:110-4. doi:10.2307/3002019 pmid:20287815. Hróbjartsson A, Gøtzsche PC. Placebo interventions for all clinical conditions. Cochrane Database Syst Rev2010;(1):CD003974.pmid:20091554. Zou K, Wong J, Abdullah N, et al. Examination of overall treatment effect and the proportion attributable to contextual effect in osteoarthritis: meta-analysis of randomised controlled trials. Ann Rheum Dis2016;annrheumdis-2015-208387. doi:10.1136/annrheumdis-2015-208387 pmid:26882927. Hinman RS, McCrory P, Pirotta M, et al. Acupuncture for chronic knee pain: a randomized clinical trial. JAMA2014;312:1313-22. doi:10.1001/jama.2014.12660 pmid:25268438. Øiestad BE, Juhl CB, Eitzen I, Thorlund JB. Knee extensor muscle weakness is a risk factor for development of knee osteoarthritis. A systematic review and meta-analysis. Osteoarthritis Cartilage2015;23:171-7. doi:10.1016/j.joca.2014.10.008 pmid:25450853.